Walk around TechShop’s San Francisco location and you feel the hum. There’s $1 million worth of equipment creating a physical hum, but also the murmuring hum of dozens of people working on making their small business a reality. TechShop is a maker space where, for a monthly fee, members get access to equipment and software, from a ShopBot CNC wood router to a 3D printer. 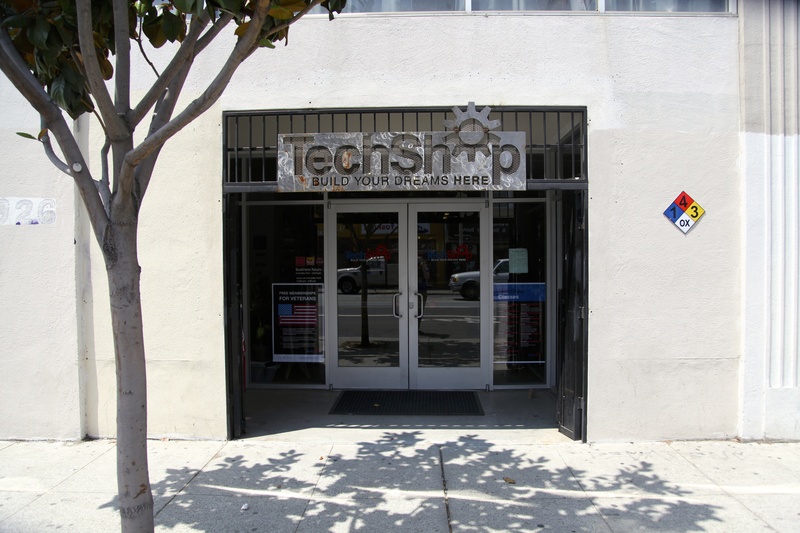 Since opening its first location in Menlo Park in 2006, TechShop has expanded to six locations across the U.S. Founder Jim Newton said the most surprising item he’s ever seen anyone make at TechShop was a perforated metal box filled with long needles. He asked the creator what they were and received an unexpected answer: brain probes. The man, a doctor at Stanford, was unhappy with commercially available brain probes and decided to make his own. TechShop has since had many more doctors come through to make surgical tools. CEO Mark Hatch described it as the democratization of hardware. Instead of paying $30,000 or $300,000 to start a hardware business, creators can invest a few hundred dollars in materials and a maker space membership and launch something big. Take Square, for example. When Jack Dorsey and Jim KcKelvey first took the idea for the mobile payment system to Silicon Valley, no one would back them. 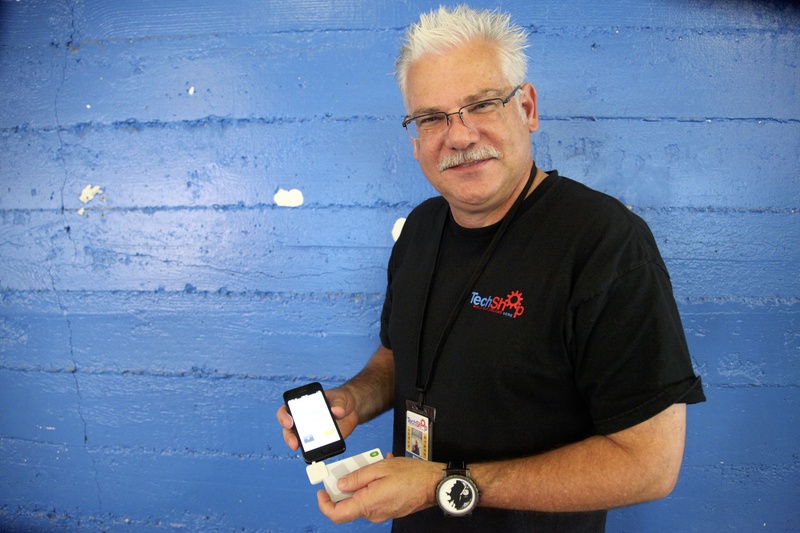 Then McKelvey built a prototype of their iconic card reader at TechShop’s Menlo Park location. They found funding. Square now processes upward of $15 billion in transactions a year and is valued at $3.25 billion. That’s only the most famous example. Nearly anyone you talk to in TechShop’s San Francisco location is working on a product that is or will be part of a business. There’s Roominate, a DIY dollhouse that exposes young children to STEM skills. Lumio is a foldable lamp with a modern design. Hatch said about two Kickstarter campaigns are launched out of the location a week, and there are plenty of people who take other routes like Etsy or more traditional direct sales. Many businesses end up running everything from TechShop. 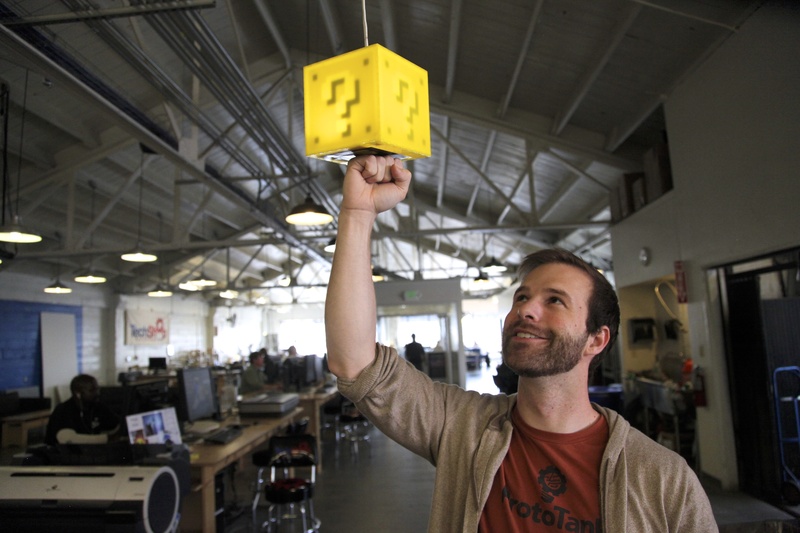 Adam Ellsworth, one of the founders of 8-Bit Lit, which builds a “Question Block Lamp” that resembles the question mark block from Super Mario Bros., said his team spent months building the blocks after they sold thousands of them on Etsy. Among TechShop members sewing, laser cutting and tapping away at laptops, highly overqualified employees built lamps that light up when you punch their underside in batches of 30. After a successful Kickstarter campaign earlier this month, they are now growing too large for TechShop. They are taking their manufacturing to China, which will allow them to grow properly. 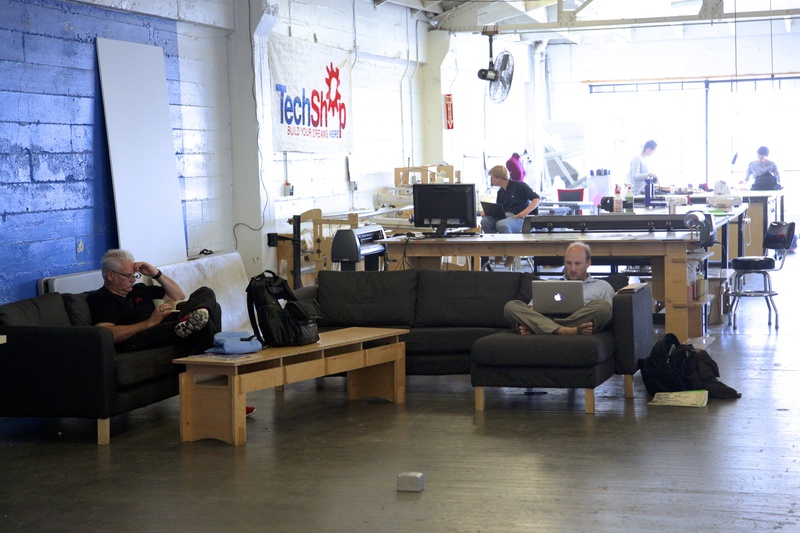 Business owners are not on their own when they work at TechShop. If they have a question about equipment, they are encouraged to ask other members for advice. Collaboration on projects is common. Hatch and Newton emphasized over and over that connections are as valuable as machinery to members. If they find they are in a situation like 8-Bit Lit where TechShop just isn’t big enough for them anymore, there are resources. SF Made, for example, lives on the top floor of TechShop. 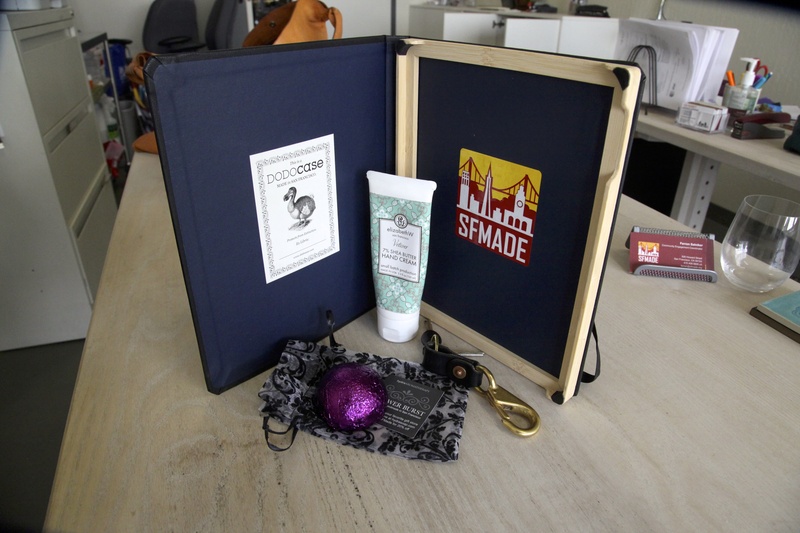 They can connect companies with local San Francisco manufacturing centers or get their product placed in stores. DODOcase, which builds iPad and iPhone cases with traditional bookbinding techniques, made its first prototypes at TechShop before partnering with SF Made. Ellsworth is a founder at ProtoTank, which is also located on the top floor. Ellsworth said they have an open door policy for TechShop members, who can walk in at any time and ask for advice on a project. They also often end up helping ProtoTank, which has built everything from a glowing lab coat to novel sign technology, too. Newton likened the maker trend to desktop publishing in the 1980s. It was expensive and too difficult for anyone but experts to use. Now, everyone is a desktop publisher. It is so ubiquitous that no one even refers to it as “desktop publishing” anymore. Hatch said there have been five inventions from TechShop members that he believes changed the world. 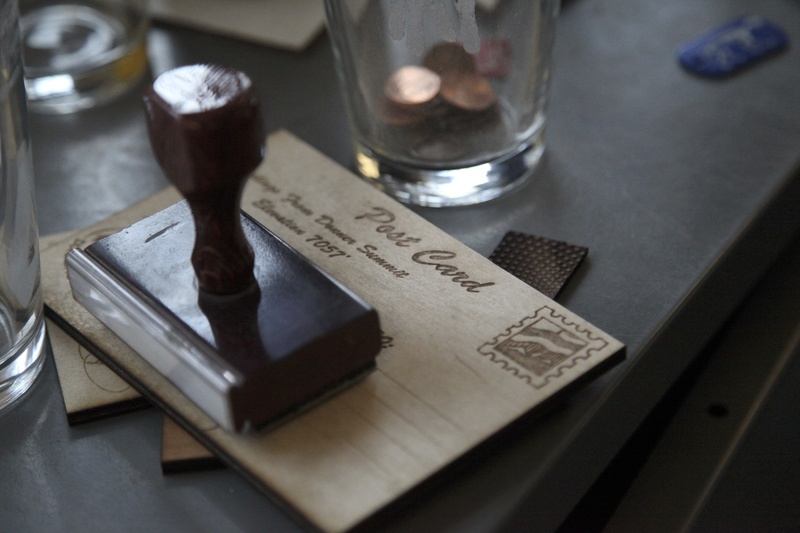 There was Square, which gave anyone access to a payment system. Then there was a nitrogen detection machine that can tell farmers the minimum amount of fertilizer they need to apply. 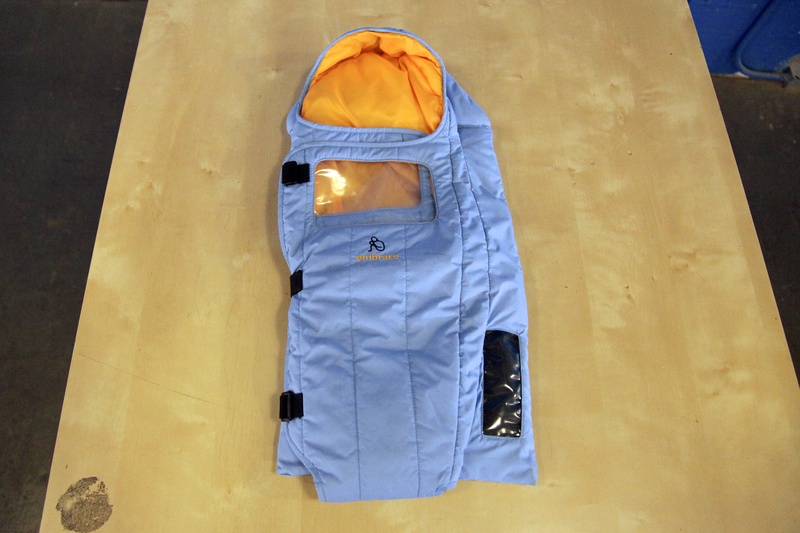 An improved irrigation system, cooling cabinet for servers and low-cost sleeping bag that protects premature babies from hypothermia were also prototyped at TechShop. If the whole world has access to maker tools, Hatch thinks the amount of ideas will keep building. Don’t buy the hype. Techshop opened an RDU location in NC and then yanked the rug out from under its members by giving almost zero notice that it was closing, selling class seats in the weeks leading up to the closing that were scheduled for after the closing, and also failing to be cooperative with issuing refunds when they shut the doors. Techshop is a business like any other. Poorly run and always trying to make itself appear that they care about more than the bottom line. Seriously,don’t EVER pay for membership more than a few months out. The gear is worth the money, but don’t bank your company on them sticking around or giving a darn. @Signe. “They are taking their manufacturing to China, which will allow them to grow properly”. It is unclear the implied meaning of this comment. I assume it implies that manufacturing costs will be lower in China than in the States. Rather than the States would be improper. I wonder if Adam Ellsworth reached out to any domestic manufacturers before deciding to go to China. There are many great domestic options available and hopefully the TechShop and SF Made are providing guidance that includes evaluation of domestic manufacturing options as well as offshore. Good article and great idea at TechShop.